Laura Sampson, founder of Station's Archived Memories at Rocky Mountain Public Media, interviews a longtime fellow volunteer. The archive includes more than 200 interviews with station staff and volunteers. 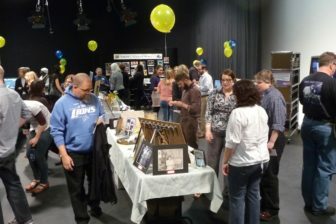 Realizing that the 60-plus-year history of Rocky Mountain Public Media, founded in 1956, is rich and unique, a group of dedicated volunteers organized a project over 17 years ago known as Station’s Archived Memories (SAM). 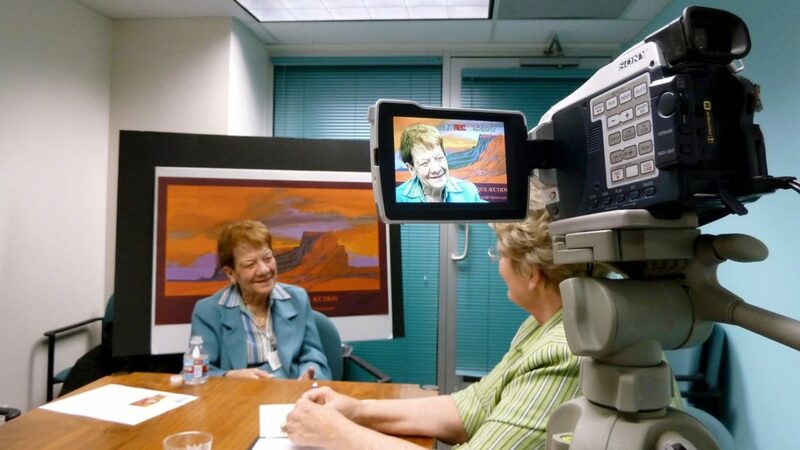 Established in 2000 through a CPB grant, the mission of SAM is to identify, document and preserve the history of Rocky Mountain Public Media relating to its volunteer, programming, community outreach and administrative operations. Rocky Mountain Public Media volunteers pose for a photo on the station’s birthday (Jan. 30) in 2015. Over the years, a rotation of at least 200 volunteers have continued to give freely of their time to create, develop and maintain the archives. The volunteer group averages 35 people annually and is subdivided into several topic-specific committees. Monday through Friday, volunteers can be found in the SAM Office at Rocky Mountain Public Media organizing and digitally preserving local productions, photographs, memorabilia, station documents and oral histories. The accomplishments of this remarkable volunteer group are staggering. As of September 2017, over 95,600 items have been numbered, electronically archived and preserved for Rocky Mountain Public Media. Every archived item is photographed or scanned and assigned a unique accession number. All known details about the items are entered into the SAM database. Along with archiving historic and current information, SAM maintains a directory of all employees of Rocky Mountain Public Media since its inception in 1956. The directory contains a photograph of each staff member and lists their names, job titles, years of employment and, if known, current contact information. Additionally, a 130-page ongoing timeline of the station’s history is regularly updated as milestones are discovered or achieved. Rocky Mountain Public Media staffers peruse a 2015 exhibit organized by the station’s archives. Any public media station could easily replicate the volunteer-driven SAM Project. In 2003, the volunteers authored a complete SAM Toolkit explaining their organizational structure and procedures and distributed a copy of the toolkit to every PBS station in the country. After 17 years of experience, archive methods and procedures have changed, but the basic premise remains the same. Does your station have an upcoming milestone anniversary or event? Would you like to have an archive about the entire history of your public media station? 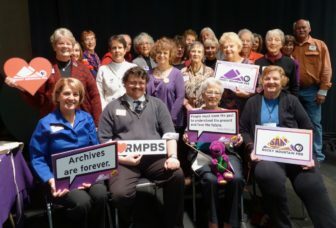 The volunteers of Rocky Mountain Public Media welcome all inquiries about creating and organizing an archive project. Please contact Volunteer Coordinator Susan Barber for further information. Laura K. Sampson is the founder of Station’s Archived Memories at Rocky Mountain Public Media and has been a volunteer at the station since 1974. In the late 1970s, the critiques by CPB’s Minority Task Force pushed NPR to increase minority employment and training programs and served as a case study in why racial diversity in decision-making bodies matters.